I’m David Baldwynn, an open source advocate and Node.js developer. I’m also the creator of Tellform, a free, open source form builder similar to Google Forms or TypeForm. TellForm spawned out of a contracting project for a medical client that required on-site hosting of a kiosk form app. After a few weeks of building a simple kiosk form app, I decided I wanted to make my app reusable. So last summer I created a dynamic, self-hostable form builder that was to become TellForm. After working on TellForm for a couple of months, I decided to open source it in September 2015. Despite the slow initial launch with only a few users per day, I used my existing users to iterate and improve TellForm. This led to the adding of multiple new features, including the Google Analytics integration and the built-in form analytics page. As one of the few UX/UI focused open source form builders out there, I also sought advice from designers and continued to iterate on the form design. Thus, I added animated scrolling and user-friendly input validation to my form. HackerNews ended up posting about TellForm, which then led to Product Hunt hunting it. These events further legitimized TellForm and increased the project’s awareness. This brought more views and with it a designer, Arun Pattnaik, to join my team permanently. 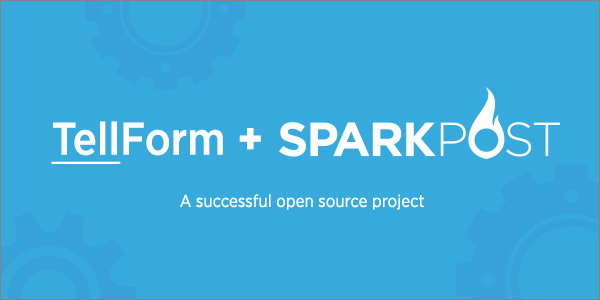 As a web developer, I wasn’t initially aware of SparkPost. However, I had to look for an alternative email API to power my email signup verification process during Mandrill’s cessation of their free tier. After looking for over a month I settled on SparkPost. Its generous free tier, paired with its great documentation convinced me to make the jump. TellForm currently uses SparkPost’s SMTP relay to power its user verification process through the node-email-verification library (which I also maintain). This works by creating a temporary user account when the user signs up along with a verification token. When the user clicks the verification link (that contains the verification token) in their email, node-email-verification copies the data in the user’s temporary account to a permanent one and saves it. If the account is not verified within a specified time (that is set in node-email-verification’s configuration), it is deleted and the verification link becomes invalid. With SparkPost, TellForm has been able to grow from tens of views a day to hundreds. Furthermore, it has also allowed us to grow as an open source project. Liked this post? You may also like our Developer’s Email Survival Guide.